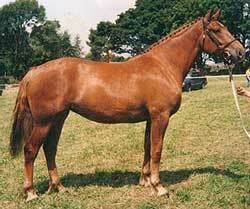 The Irish Draught was the horse of the countryside, not a distinctive breed within the Irish horse population, but the product of his environment, evolving from the adaptation of the native horses on the small Irish farms to work in hand. The British agriculture stimulated the breeding of the regional heavy horses, the Suffolk Punch, the Shire and the Clydesdale. The Irish farmer, however, needed and bred for himself a lighter, more adaptable animal that he could yoke, drive and ride. The Irish Draught's qualities of strength, sound constitution, docility and intelligence are well recognised. Today the Irish Draught is sought after for its breeding qualities, being used more and more to get extra bone and substance in the progeny. 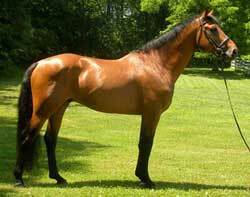 When crossed with the Thoroughbred, the Irish Draught is the foundation of the Irish Sport Horse industry. The best horsemen in the world have testified to the outstanding qualities of the Irish Sport Horse. Showjumpers, eventers and huntsmen all combine to hail the halfbred horse as the best sporting horse in the world. The Irish Sport Horse is sound, clever and an outstanding performer over any track or any country. His perfoming life lasts longer than the horse of any other country. 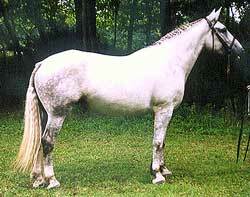 High Point Equestrian Center uses pure bred Irish Draught mares as the foundation stock to our breeding program. 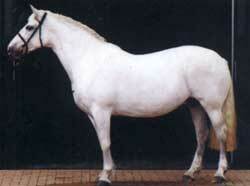 Each mare is bred to either an Irish Draught or a Thoroughbred stallion with proven jumping ability and soundness. When choosing an Irish Draught broodmare one looks for good conformation and movement. 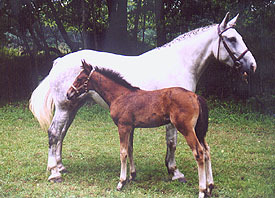 The mare is 60 percent responsible for the next generation and the action of the foals are frequently the same as the mare. All of our mares have outstanding bloodlines. Although you have to make sure you have quality bloodlines, it is not possible to calculate the importance of pedigrees on paper alone. Pedigrees are only useful in conjunction with sight and memory of the stock itself. 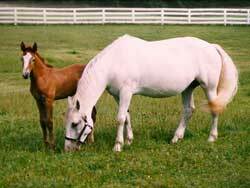 Attributes looked for in the stallion are those that would compliment the conformation of the mares to produce outstanding offspring. The stallions must have correct conformation, good size of bone (even with the Thoroughbred) and proven athletic ability and soundness. Our goal is to produce beautiful, well proportioned, very sound, willing and intelligent offspring. So far our results have been very favorable.